I have been doing a bit of treasure hunting lately. 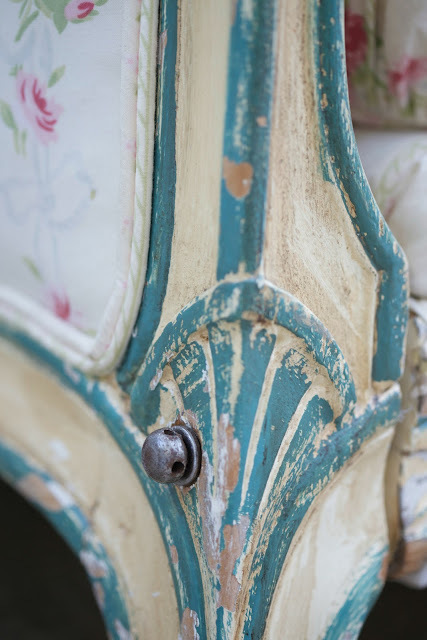 Scouring For Sale posts, thrift stores and roadside sales for vintage treasures and old pieces of furniture that make my heart sing. sometimes the vintage fairies sprinkle a bit of pixie dust on you and you find yourself gazing at an absolutely incredible piece that takes your breath away. that you buy that piece before even seeing it in person. Yes, I was that girl recently. And I'll be honest, I have no shame. I was also doing some renovation and styling planning for some upcoming projects. Well, okay. Needed is a strong word. More like... had. to. have. I have actually picked up several amazing finds in the past several months on Craigslist. it seems like the perfect time to start revealing some of my recent junking finds. And most of the time- it really is pure luck bumping into something. or that I feel I need. And when I was looking this time, it was business as usual. but wasn't finding any knock your socks off pieces. Well, that one completely stopped me in my tracks. Romantic cottage style French floral ticking stripe fabric. 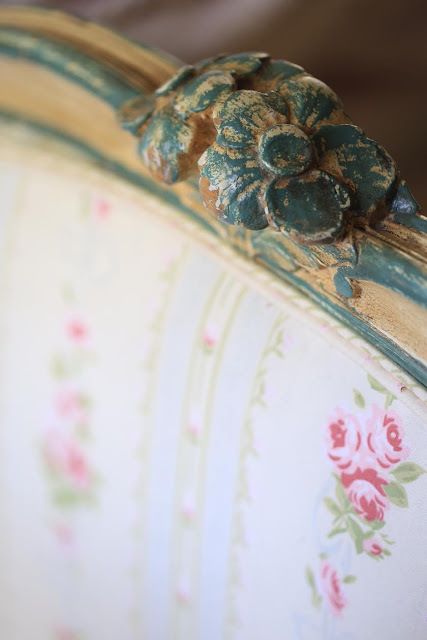 and a delightful curvy frame painted in old yellowed paint with teal accents. I literally sighed out loud. I hadn't even read the detailed description in the ad yet. and original old chippy painted patina. I sighed, and looked again. And I loved it. close enough to my comfort zone to make an offer. And so I was just going to have to admire it and move along. Which I did. For about 5 minutes. I emailed just to let them know that it was gorgeous and that if they decided that they ever wanted to sell it for less- please let me know because I would be interested. 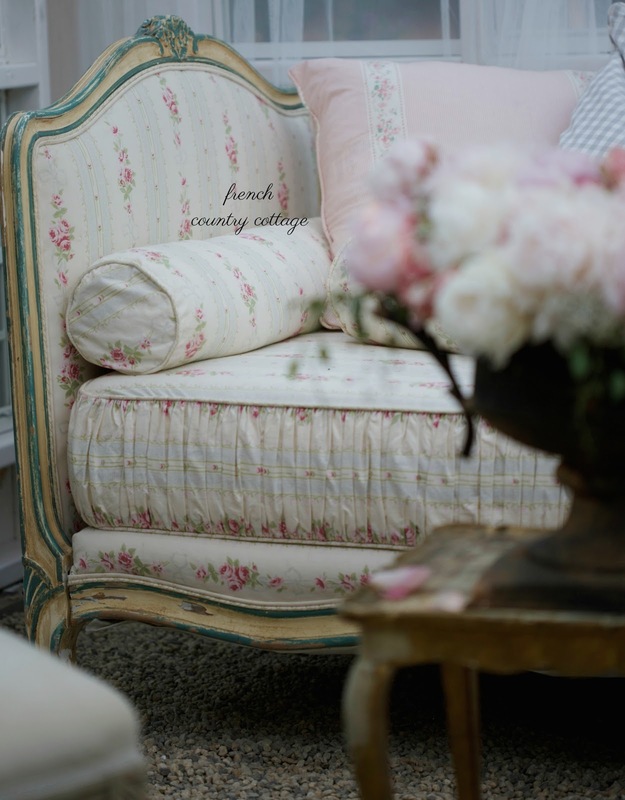 amazing French cottage style daybed. and even so- I was doing a big old happy dance. as much as it was. drove over and picked that treasure up for me. while I was at High Point, my husband text me a photo of the daybed in his truck. and we chatted about it how charming it was, where it would go- it was a fun moment for sure. 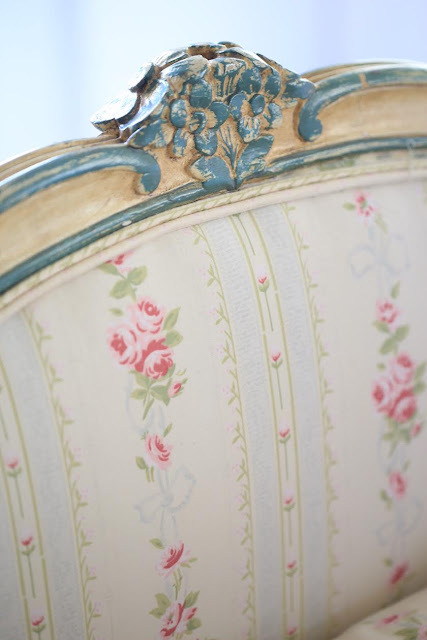 So there you have the story and here it is in all of that amazing French style antique glory. I am in absolute love with every little thing about it. It is a delicate and dainty girl that stole my heart at hello. Even before we had met in person. And wondering if anyone might have an idea of age by chance? From what I can tell - it might be anywhere from 1880's to 1930's. Very pretty! With matching bolsters even. I can't help you with the age, but want to add that we have a daybed and a sleighbed, both of which are handmade, and the workmanship is just incredible. You are lucky to find a piece with so much carved decoration. It really is a treasure :) Thank you for stopping by! It's beautiful Courtney! Just right for you and your cottage! What a lucky find! It is beautiful!! I would guess the age is the same as your guess - 1880s to 1930s as well... it seems that the era that a lot of the French antiques were imported in the US. Enjoy! I absolutely adore it when beautiful treasures find us, like this one did you. Meant to be. You will enjoy her over and over. She's a beauty and a very rare find. 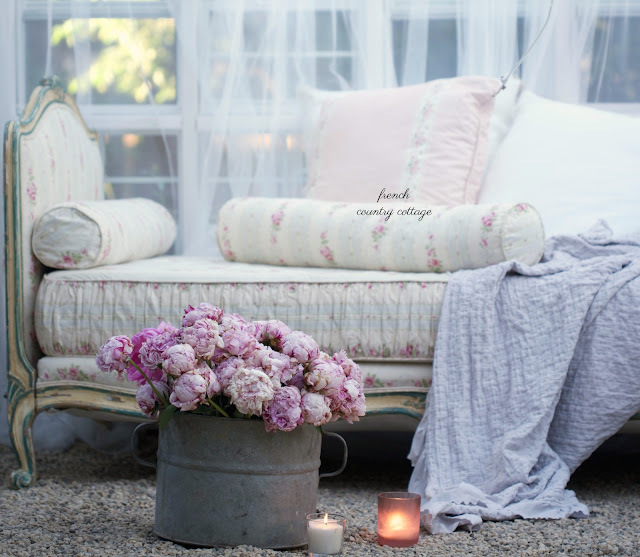 I've never ever seen any day bed this gorgeous. I scour antique malls constantly and I agree with you, sometimes it's just meant to be. You had to have it! I love that your husband went and got it for you....and you showed Rachel Ashwell your picture ...all beautiful memories that go along with your beautiful daybed! Haha!! :) Indeed! Thank you Jane! Courtney, it was obviously meant to be yours! It is perfect in every detail, and I love the vintage textile. It looks great in front of those windows. What room do you have it in? Your husband is a great guy! Don't know that mine would be so accommodating if it was bringing in another piece of furniture. I've met Rachel Ashwell at her Prairie Compound near Round Top. She is an absolute sweetheart. I have long admired her style and chatting with her in person was just the best. 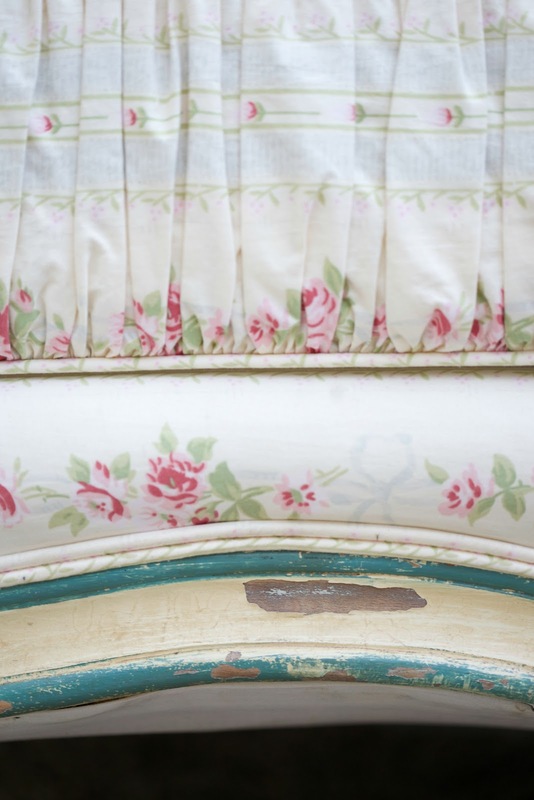 This is about the dreamiest French daybed I've ever seen! 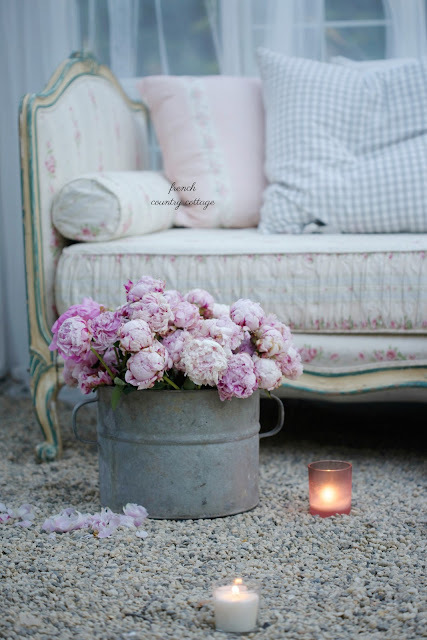 How marvelous - and I loved your 'pinch me' moment sharing your new find with Rachel Ashwell! That's just too cool! It is such a treasure- I was so excited to find it! Thanks for stopping by Kathy! Will you be at Haven this year? Absolutely gorgeous! I totally understand your needing it! I love your style and your posts! Thanks so much Vicki- so kind of you! Everything about this piece is absolutely gorgeous. Love the ruching and vintage fabric. It clearly was meant for your home. Great find. 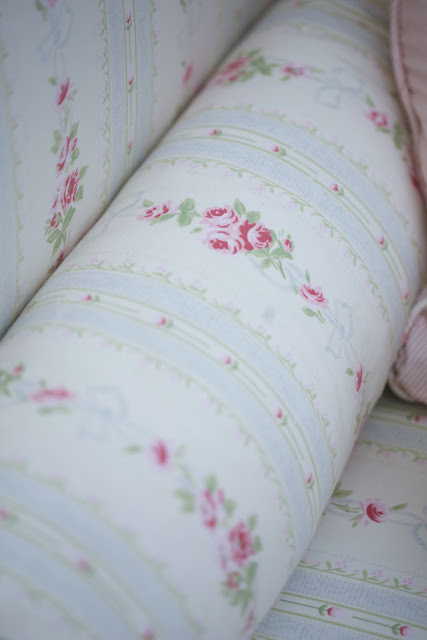 I love that fabric too- and the ruching is so pretty! Thanks Mary! Ah, love at first sight. Love the story and sentiment about this lovely daybed - it will bring a smile evertime you see it! So wondetful when things magically come together! What a grand find. Meant to be yours and I am sure the lovely piece is completely aware she belongs to someone who loves and appreciates her. She will always make you smile. Thanks Mary! It really is perfection color, finish and detail wise! 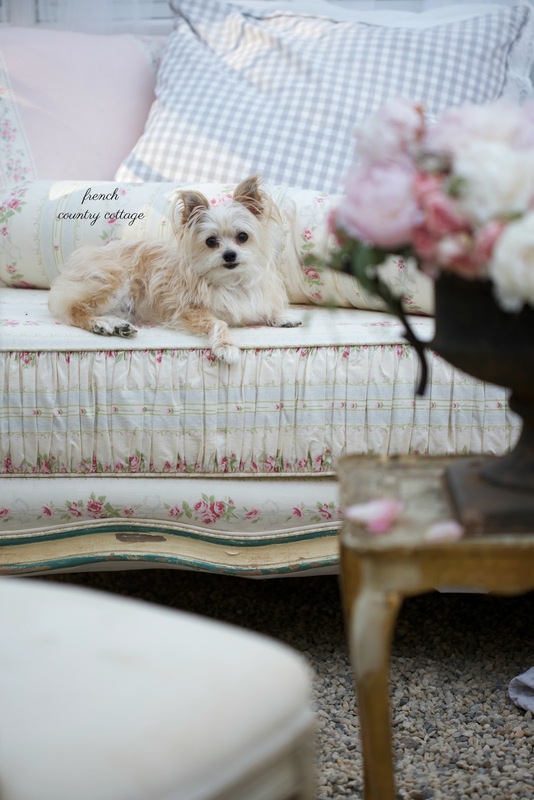 Sweet Pea is definitely a delicate and dainty girl too! :) She just went to the groomer and they trimmed all her long hair- which I have mixed feelings about- and she looks even smaller than before now. haha. I would have snatched it up in an instant too. It's amazing!! What an awesome score!!! It's so beautiful!! That must have been awesome to share it with Rachel !!!! Your blessed to have an awesome husband . I LOVE IT that turquoise just makes it. It such a pretty, dainty and beauty of a piece. Great find!! What a fabulous find! Love it!